Everyone at the Network Connections Group USA is or has been a cabling technician on site and we use these skills to put our company ahead of the rest. We are continuously developing our labeling solutions which comprise of cable label sheets, patch panel labels, data jack labels, fiber labels along with our FREE web software and templates. Our label solutions and wrap around cable labels are tested and used by our guys each week, the laser sheet labels are very cost effective and provide the best solutions for wire labels and wrap around labels for structured cabling projects. Our Laser printable Cable Labels are better and ideal for multi-purpose labeling projects that can benefit from self-laminating labels. 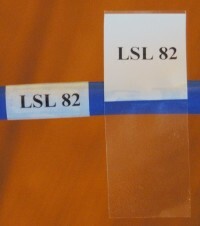 Our Laser printable Cable Labels are for multi-purpose labeling projects that can benefit from self-laminating labels. Our Laser printable Cable Labels are ideal for multi-purpose labeling projects that you can benefit from self-laminating labels. The film is coated with a permanent, UV-resistant, pressure-sensitive adhesive. Our labels are backed with a two-sided, poly coated, printable, lay flat release liner. The film is approved for indoor/outdoor use with occasional exposure to oil and water. Suitable for all standard office laser printers. RJ6, RG6, VGA and other Data Comm Applications. Network Connections Group USA is a Made in the USA Supplier, so you can buy from us with peace of mind.